Where are we in God's agenda? What hour is it on God's time clock? The signs of the times point to the fact that Jesus Christ is returning soon! We are in the last days! We are coming into a season where The Lord is bringing us to higher levels in the spirit, where He is bringing us out of the wilderness into our promised land and where we will see the fulfillment of the promises of God to us. A great revival is sweeping across the earth. God is moving in ways unlike any we have seen or heard of before and now is the time to go higher. God is continually urging us to ascend to greater heights in and with Him. We must not be content to remain where we are but must desire to go higher and now is the time to rise to the next level. In this very important and dynamic Prophetic message, Richard Pace shares the heart and mind of God on where we are in God's agenda not only for the Church but also, the world and the eternal significance of this. 1 - 1.come Up Here! 2 - 2.come Up Here! 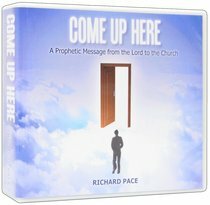 Customer Reviews For "Come Up Here"
The prophetic message entitled "Come up Here!" by Pastor Richard Pace, is an absolute must and has powerfully impacted and changed my life, bringing renewed hope and encouragement. Biblical, insightful teaching, spiritual disciplines, revelatory truths and practical application will challenge us, enabling us to make incredible strides in seeing and obtaining the fulfilment of the promises of God to us. Higher spiritual levels with God are amply and wisely elucidated in this teaching, properly equipping the Church to prepare for the return of the Lord Jesus Christ. Pastor Richard Pace is clearly emerging as a prophetic gift to the Church. I listened to the series "Come Up Here" and it has been very inspiring for me. Not only did it revive things that I already knew but gave me fresh revelations of the things of God as you go to the next level with Him. I would greatly recommend it to anyone who is keen to keep growing in God as there is no limit for one wanting to go higher with Him.